Since the last time you heard from me, I have achieved a great deal. In just 14 days, I gained three kilos. I managed this Herculean, or should I say Bacchanalian feat by trying to fit three meals for every mealtime into my day. I was in Japan, so my body was waking me up at silly o’clock every day making three breakfasts an entirely plausible achievement. Three lunches are harder to manage so I often had to make do with two. Then I had an early supper, a late one, and a midnight snack. This is all down to my fear of missing out on good food, of which the land of the rising sun has plenty. It really boils down to focus. An unwavering dedication to the pursuit of perfection at whatever it is one is doing. Driven by a single purpose, that of absolute mastery at any one discipline, the Japanese chef will do one thing exceptionally well. I pushed myself further this time. For instance, I tried something that could be quite unnerving – chicken sashimi. All the tastiest bits of the chicken are served raw – liver, heart, tenderloin, breast, cartilage, and other bits of the chicken we normally discard. Unlike cooked chicken, that could end up tasting the same throughout, this approach yields a whole different spread of flavours and textures. The chicken is bred specially and fed properly so it is full of the actual taste of the animal as opposed to farmed birds that taste of cardboard and recycled packaging. The notion might sound quite alien but then imagine eating raw fish from a place where they don’t know how to treat it from catch to table. It would make you seriously ill. The wrong prawn could send you to hospital faster than picking a fight with a drunk cage fighter yet we trust restaurants around us to prepare a scavenging aquatic cockroach and serve it as gambero crudo. This restaurant can afford not to make mistakes. They only serve chicken and have a relationship with a breeder so they pick one specific species of the animal for flavour and control the process from egg to plate. The result is a raw material that’s excellent and a couple of cooking methods (raw and charcoal-grilled) that mean you’re practically guaranteed excellence. The Japanese market is large enough to allow for this knife-edge focus. There are enough people in the country to allow single-dish restaurants to thrive and specialise further in a virtuous cycle of excellence. I’d love to go on and on about this and dive deep into my weird and wonderful adventures but that’s a story for another day and another medium. Let’s just acknowledge that our tiny Islands simply do not have the scale to afford much of this focus so market forces dictate that we spread the offering a little more broadly. Rather than having the luxury of being absolutely adored by a tiny sliver of the population, we are condemned to broadening our popularity to be liked by at least half of it. This is why the typical restaurant menu could include pasta, pizza, steak, fish, and hamburgers. And chicken nuggets for the little ones, because we all know that’s the cornerstone of infant nutrition. As bold as it sounds to be good at all that, it is a spread we’re completely used to seeing. There are those that step up the ambition and that’s not always a good thing because of the risk of spreading one’s abilities a little too thin. I had a little taste of this when out and about in St Julian’s and the better half was stricken by the desire for a good curry. We were a staircase away from Sharma, that’s right on the water’s edge of the Portomaso Marina, so the choice was made for us by our location. 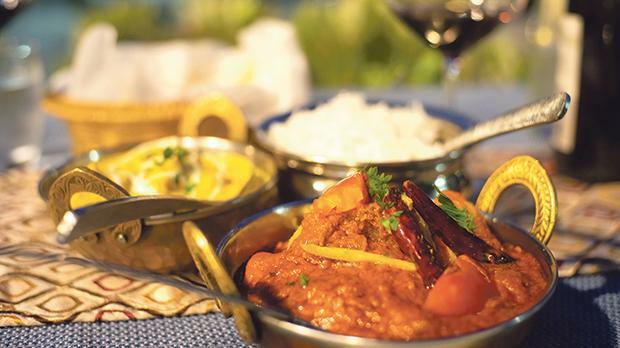 The restaurant claims to serve Indian, Arabian, and Mediterranean food. Now, if you think about that blend, you realise that you’re probably looking at an area that hosts around a fifth of the world’s population and that enjoys an incredible variety of culinary styles. Trying to cram a fair representation into a single kitchen is a pretty tall order. The location always struck me as a little odd. The marina isn’t pretty in the way a natural bay can be – the regularity of identical apartments around a concrete jetty feels more manufactured than anything else. It is quite peaceful in the evenings though so there’s nothing terribly wrong with it. We had our pick of tables on the terrace and this is the perfect time of year to sit outside during the evening. A young man brought us menus and we ordered their dips platter to start with before taking the time to look through the menu properly. Having something to nibble stops me from ordering half the food on the menu in a ravenous frenzy. Another young man arrived presently, bringing a dish with two mixed vegetable bhaji as an amuse bouche. I can’t tell where he’s from but if I were to guess he was quite a fine representation of the North African continent. No sooner had he walked two paces, the better half exclaimed, “Kemm hu ħelu!” (he’s so cute) I pointed out that If my estimate of his origins were accurate, there was a very high probability that he’d understood that and, without skipping a beat, she pointed out that no one minds a little flattery. Touché. He was grinning quite happily when he returned with our dips so, as usual, she’s right. 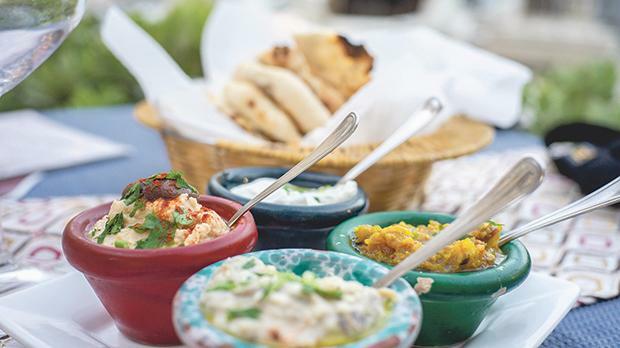 The mixed dips are served in four, tiny bowls with a basket of warm, fresh flatbread. The bread is excellent, reminding me of the sort that’s cooked in a tandoor oven. The dips themselves consisted of a rather bland hummus, a decent salatah mashweya, a good baba ghanoush, and a stingingly potent and thoroughly enjoyable garlic dip. It was time to place our order and I was enticed by the possibility of a tagine, but put off by the fair warning that this would take 40 minutes to serve. The menus sound pleasantly enticing, going from North African staples like boureek, falafel, harira and kuskeh dishes to curries, every way to biryani, and a whole section of tandoor dishes. The Mediterranean sections sound more like traditional Maltese and they include items like aljotta, rabbit, and braġjoli as well as a couple of Italian pasta dishes thrown in for good measure. I decided that, having started with the North African section, I’d join the better half for a curry. We ordered an inexpensive red wine and sat there watching the evening turn into night over boats that I can’t afford. We didn’t have long to wait. Our main courses were served quite quickly and the man who did the serving pointed out that he’d relayed my request to the chef to hit me with the hottest vindaloo he could muster. Two chillies garnished the dish quite ominously and you could practically smell the heat from a distance. I thought I’d taste the chicken korma first. If the chef had done as chefs do with that request, there would be no way I’d be able to taste anything else after it. Korma is one of the least intense of sauces from the subcontinent and this took subtlety to a level of virtual tastelessness. The chicken was tender but the sauce was so insipid I could hardly make out any of the flavours. Salting it would have helped. My vindaloo was hot. It was the kind of heat I’m after when going for this dish because I don’t eat very hot food often but when I do I don’t like half measures. The meat was odd because chunks of it were tender and juicy while others were tough and stringy and all but inedible. I appreciate that hot curries don’t need the best meat in them and I’m not expecting an expensive cut but this was pushing it beyond the dismal expectations one has of a curry. The two potatoes in the dish were the parboiled ones in a bag of frozen oven-roast but they hadn’t cooked so there was no way my fork could pierce them. Short of tasting the entire menu, I can’t tell whether the issue is with the curries, but if an item is on the menu then there’s no reason for it to be insipid or to use poor ingredients. I’m not expecting miracles of a menu with such ambitious scope but we’re sitting in a prime location and paying €60 for the meal so perhaps a little more focus could actually help matters. As it is, I have no real motivation to find out whether there’s anything there worth returning for.